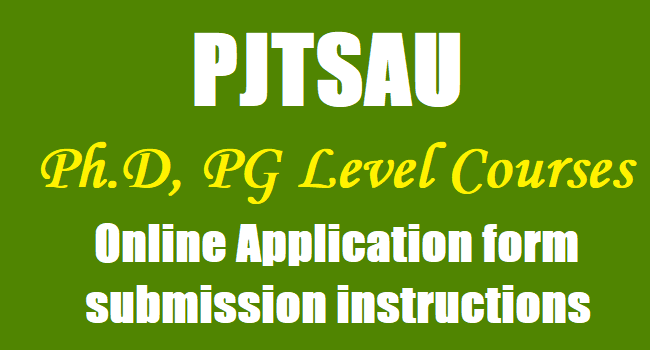 M.Sc Level Courses, Ph.D Level Courses Online Application form submission instructions and Application for Admission into Ph.D courses/M.Sc Courses under In-service Quota of PJTSAU and more details on web portal. The applicant should read the instructions very carefully before proceeding to apply online. The applicant should keep scanned copies of all documents ready before proceeding to apply online. PJTSAU Ph.D, M.Sc, MBA, M.Tech Entrance Test 2018 Notification for PG PhD courses admissions through #TS #Agriculture PG Entrance Exams 2018. Professor Jayashankar Telangana State Agricultural University(PJTSAU) will issue the Post Graduate Admission Notification 2018-18 in May 2018 and the Agricultural University would invites applications from the eligible candidates for admission to the P.G. Courses and PhD courses. PJTSAU TS Agriculture PG Entrance Exam 2018, Online Application Form, Last date for apply online, exam date, counselling dates, eligibility criteria, how to apply details are available in the given links. The candidates should submit copies of the following certificates alongwith the application : Documents enclosed to the application shall not be returned. Hence candidates are advised to enclose only copies of the certificates. a. Two self addressed (with PIN code) envelops affixing postage stamps of Rs.5/- on each. b. Memoranda of marks (of all years) obtained by the candidate at B.Sc. and M.Sc. level examinations or transcripts of the above examinations. c. Provisional/Degree certificates of the above examinations. d. Date of Birth certificate. e. Candidates belonging to Backward Classes, Scheduled Castes and Scheduled Tribes, should enclose Social Status Certificate issued by the competent authority. The admission given under this quota shall be provisional till the genuineness of the Social Status claims of the candidates are certified by the respective Directorates of the Government. g. Study certificates from Heads of recognised educational institutions from VI class onwards. Those who appeared for any examination by private study should enclose residence certificate. candidates who passed their examinations from Universities other than ANGRAU. The originals of the above certificates should be produced at the time of interview and submitted at the time of admission. 1. The candidate has to visit the website : www.pjtsau.ac.in and fill the OTR (onetime registration) application. 2. The applicant should use only Chrome/Firefox browsers while filling the application online. 3. Use the links and buttons available on the page to move from one page to another. 4. The applicants should note that the admissions will be made as per the relevant government orders applicable at the time of admission. 5. It is the sole responsibility of the applicant to ensure that he/she fulfils the specified eligibility in toto before submitting the online application. 6. Only ONLINE application will be accepted. No application will be accepted in any other format and will be summarily rejected. 7. The applicant should carefully read the information brochure before proceeding to apply online. 8. You can either download a copy of the prospectus Click here to download or read it online. 8. The applicant should read and understand all the instruction Click here to download and eligibility criteria for admission before proceeding to fill the online application form. The applicant is advised to take a print out of the instructions so that he/she can refer to the same while filling the form. c. Download Hall tickets for PG Courses : ..
d. Download Hall tickets for Ph.D Courses : ..
10. The candidates for admission to the PG & Ph.D courses with upper age limit of 40 years as on 1st July 2018. 11. The applicant should furnish all the details while filling the Online Application Form. While filling the online application form, the applicant is advised to save the application in draft form until final submission. 12. After successful submission of the data, an application number will be generated and this can be used to complete the remaining steps of the application form and can also be used for future correspondence. 13. Request for change in any particulars once given in the application will not be entertained. 14. The scanned passport size (3.5 cm x 4.5 cm) photograph of the applicant should be in JPEG format of and not exceed 1 MB file size. 15. The applicant\’s signature should be scanned in JPEG format of [3.5 cm x1.5 cm] and not exceed 1 MB file size. 16. The documents to be uploaded should be scanned in png/jpg/jpeg only. 17. The size of the scanned documents to be uploaded should not exceed 1MB. i. SSC Memorandum of Marks or equivalent examination certificate, showing the evidence of the Date of Birth. iii. In case, an applicant belongs to Backward Classes, Scheduled Castes and Scheduled Tribes, the latest certified copy of the Social Status Certificate issued by the competent authority. iv. Bonafide / Study Certificate from 6th to degree level. v. Residential Certificate (Those applicants who are having a break in the years of study for reasons other than failure or those who passed the qualifying examination by private study have to submit this certificate issued by the Tahsildar. In case, the applicant has resided in more than one place, separate certificate from the Tahsildar, should be furnished for such places of residence). vi. Submission of false/fake documents will lead to summary rejection of the application. 19. Payment of application fee: For applicants belonging to OC and BC social status, the fee is Rs. 1,325/- and for applicants belonging to SC and ST social status, the fee is Rs. 725/-. The applicant has to select Debit Card /Credit Card (Visa / Master Card)/NET banking/ Wallet option to pay the application fee and follow the online instruction to complete the payment of fee. 20. After payment of fee, the PDF application will be generated which contains the particulars furnished by the candidates. 21. The application fee once paid will not be refunded under any circumstances. 22. Handwritten / typed / photo start copies / outside printing application forms will not be accepted and liable for rejection. 23. After successful submission and payment, the applicant will be able to print the application form. 24. A computer generated hard copy of the online application filled-in correctly and complete in all respects including payment of fee should be downloaded and sent through by Speed Post only so as to reach The Registrar, Administrative Office, Professor Jayashankar Telangana State Agricultural University, Rajendranagar, Hyderabad – 500 030 on or before 22-6-2018 at 4.00 PM. The University will not be responsible for any postal delay or loss of application during transit in this regard. 26. The applicant is informed that mere submission of an online application does not guarantee allotment of seat. 27. If an applicant has been found to have furnished wrong information or deliberately suppressed any relevant information or uploaded improper documents, his/her application will be summarily rejected. 28. The University is not responsible, for any discrepancy in Bio-data particular while submitting the application form through online. The applications are therefore advised to strictly followed instruction and prospectus in their own interest before submitting the application. 29. The particulars furnished by the applicant in the application form will be taken as final and the data entry is processed, based on this particulars only by computer. Candidates should therefore be very careful in uploading / submitting the application form online. 30. In complete / In correct application form will be summarily rejected. If any lapse deducted during the scrutiny, the candidate will be rejected he/she comes through the final stage of selection. 32. For admission into Ph.D. programmes, the candidates should have submitted the M.Sc. level thesis on or before the last date prescribed for the receipt of applications and must complete the thesis final viva voce examination successfully as on the date of registration in case of selected candidates.